Our days are up to 8 hours and include hot drinks, homemade biscuits and cakes. Lunch is homemade soup and a selection of sandwiches using local produce when possible. Most special dietary requirements are catered for. Our cosy cottage used to be the old post office in the village of Salen. The holiday let is an annex attached to our house Dungallen, with its own drive and entrance. The garden is next to open ground with views to the mountains beyond. With a shared love of Mull it seemed a natural step for us to be a full time part of Mull life. The name Enjoy Mull came from us constantly saying how much we have enjoyed Mull ourselves. Fabulous day despite the weather being far from ideal. Collected by Jakki from our caravan site which was a big help to us as meant we didn't have to pack up the motorhome to travel out. The weather was due to close in later. so chuffed we managed to spot our first ever golden eagle in the morning + a male hen harrier. It soon became clear Jakki knows the island like the back of her hand - a massive help to first time visitors. Homemade cakes, biscuits, sandwiches, crisps and soup kept us very well fed - sorry there weren't any leftovers after our angelic teenagers demolished the lot !! After lunch we saw otters, seals and a white tailed sea eagle to round off an amazing day out and a fantastic insight into the history and nature on Mull. We lost count of the different birds and all manner of wildlife Jakki was able to show us. I hope this review gives a flavour of what you can expect, even on a wet Halloween. My friend and I from Toronto spent a wonderful day with Jacqui on safari on Mull. She picked us up at our hotel in Tobermory and gave us a day of touring the island from 9 am to 6 pm when her husband dropped us off back at our hotel. 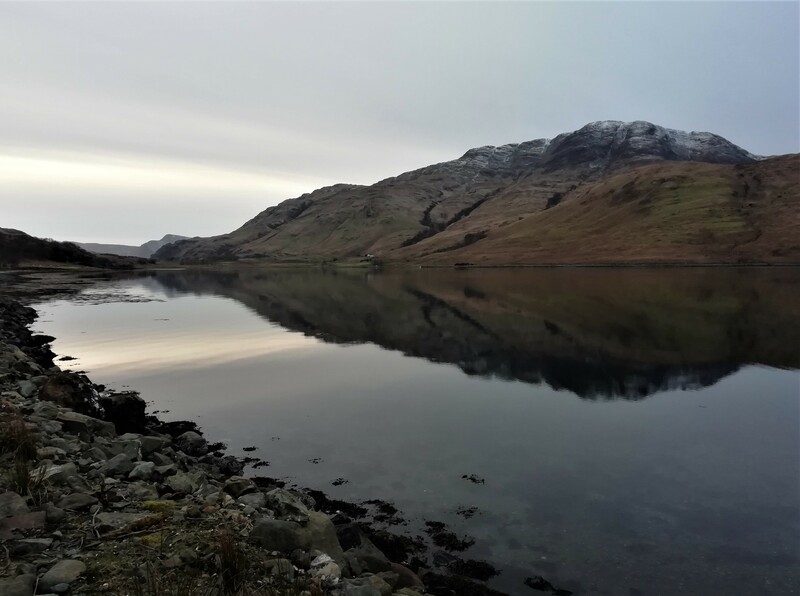 Jacqui's knowledge of the wildlife, the vegetation and the history of the island was in depth and her love of the Isle of Mull was infectious. She provided us with our own binoculars, as well as 2 telescopes on tripods to help us to spot and focus on the hawks, falcons, eagles, swans, otters, deer, local songbirds etc. The home baked cakes, cookies, carrot lentil soup which accompanied 4 different types of sandwiches, all washed down by and assortment of coffees and teas were a welcome treat. Thanks to Jacqui and the folks at McKinley Kidd for arranging such a glorious day!! What a day! After the torrential rain of the 31st of December, New Years Day dawned cool, dry and clear with lots of blue sky. Getting into the spacious mini-bus was fine despite me being not too nimble as registered disabled. Binoculars are supplied in front of each seat as well as a bird identification guide. The spotting scopes were securely affixed in the rear of the vehicle with the wonderful food; more of that later. A lone dolphin breaching and feeding within good viewing distance. This caused a little group to form along the beach as these wonderful mammals always draw an appreciative crowd. After a busy and packed day that never felt rushed we were back at our start point. All excited yet sated. Filled with knowledge and sites all thanks to our great guides. Can't recommend them enough. Very friendly and knowledgeable with a well run and inclusive tour that kept all levels of prior knowledge entertained and informed. Comfortable clean vehicle and a great packed lunch. The rest of the year may not live up to today but the memory of it will certainly keep me going. Brilliant time.